One fun part of working in the library is seeing all the PF books out there (and we have a good collection). I’ve noticed a number of them are particularly oriented towards teens. 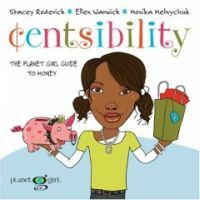 The book is Centsibility: The Planet Girl Guide to Money . I decided to do it first because it’s short, simple, and attractive. The audience is tween and teen girls. It doesn’t discuss things like investing and car loans, but it covers most of the basics. The book is divided into four sections of money management: Make it, Save it, Spend it, Share it. Money can’t buy happiness, but it’s pretty useful. And it doesn’t grow on trees or in your parents’ wallet (not all of it anyway). Make money focuses on various ways that a girl can earn money even if she’s not old enough to get a job. Odd jobs, entrepreneurship, etc. This section offers tips on things like running your own little business. Do you need startup money? Or is it something like tutoring where you can just spread the word? They have suggestions for planning start-ups, gaging your market, keeping track of your money, budgeting, and being safe while you do it. When we were kids, my sister and I had a paper and mail pickup service. That way if people didn’t want to go to the trouble of stopping and restarting the services while they were on vacation. We’d run out early in the morning to get the paper and then someone else would take the mail later. Of course, we only did it in the two closest neighborhoods. We even had a tagline “We get your paper and mail each day while you’re away.” Not high quality, but not bad for kids either. Worked out pretty well for us, except the time we got stiffed by people who brought us a nice souvenir…but we’d had plans for the money. We were too shy to ask for our money instead. Savings = choices. The book suggests saving 10% at least, maybe more if you have a special goal. And keep it in the bank. They have a lot of good questions to ask when you open an account–ATM fees, minimal balances, interest rates, etc. I opened an account with my parents, it didn’t really earn money (nor did it have an ATM/debit card), but there weren’t any fees involved, which made me happy. I don’t know what the options are nowadays, but an ING subaccount with the parents might be useful for long-term savings. Then there’s the “what if?” fund. Instead of a classic emergency fund, this is something for both contingencies and opportunities. Maybe you lose your bus pass, or perhaps your favorite band is coming to town. I think the “what if” fund is a great preparation for an emergency fund later on, but also relaxed enough for those who don’t have major responsibilities yet. A teen isn’t going to need 3-6 months income, but an extra $200 could be very handy. Since you’ve only got limited money, you don’t want to fall prey to buyer’s remorse. This chapter contains tips on being a smart shopper. The authors get lots of points for promoting budgeting–planned spending. They present it as simple and even give a quick budget outline that can be done on a piece of notebook paper. It may not work for those with more complex needs, but it should work just right for most teens. They discourage store credit plans and carrying a balance on a credit card if you’re going to use one. They contrast those debts with “good debt” like student loans or mortgages (some of you may not agree with this part). Plus, the chapter ends with a bunch of ideas on how not to spend money at all–swap meets, gifts of favors vs. stuff, etc. Having money doesn’t just mean being able to buy stuff, it means being able to make a difference. I particularly liked the section on choosing your charity—they have excellent tips for looking up a charity’s mission and how well it fulfills it (including the amount of money that goes towards programs). Or if you want to give more than money (or more money than you have), there are tips for volunteering and fundraising. For a simple book, I think it’s pretty good. It doesn’t cover a lot, but it encourages some good principles that are the building blocks of personal finance. Younger teens and tweens (seems like this guide is for those below 16) don’t need to know about life insurance, car loans, etc right now. If they can cultivate a habit of earning, saving, planning their spending, and giving, they’re on the right track. Parents/schools can teach the rest later. 4 chapters, 80 pages, friendly writing, and numerous illustrations make it a user-friendly book. The downside of that is that it’ll look dated in a few years when this style of illustrating is replaced by whatever comes next. But that’s much better than having no illustrations. Buy or don’t buy? I’d recommend it for girls as young as eight, perhaps as a gateway to personal finance. A financially savvy idea would be getting it at the library, but it’s only about $10 on Amazon, probably for less in the resale market. Stay tuned next week for The Complete Idiot’s Guide to Money for Teens. Best PF practices of the year! I Can Has $250 Book? I am looking for something to recommend to my 18 yr old daughter. She is getting ready to set out on her own and seriously needs a financial education. I think she has the savings part down though, I have at least taught her that much. You forgot to finish your third sentence, my dear. Ha! I have added two letters an invalidated your comment, Christine. 😉 I’m sure it was there at some point…I just probably edited it out when I did the link.